Had an amazing stay! Adam who checked me in was Extremely helpful and knowledgeable with the surrounding area with any information we needed. Went on a tour with Chelle and Jenny to the Capilano Pacific Trail and saw a bear!! They were amazing guides for us for the day, they had alot of facts and information for everything along the hike, they were very calm and controlled the situation well when we saw the bear right on the trail not far from us!! Props to those rad ladies! Will be back!! I really enjoyed my trip to Vancouver and staying at Samesun Hostel made it even more amazing. Their bar area was great and we enjoyed a Trivia night in which we met other travelers. The food was really good as well as the customer service. We had a private room, with easy access to the restrooms. The room was clean, private and had enough space for two people. We took advantage of their day-trip to Lynn Canyon Park for only $10, the hike was a great way to see the city. Very nice hostel! You are staying downtown - not the prettiest neighbourhood, but very convenient as you can walk everywhere. Staff is friendly, and the bar serves local beers which is really nice. Awesome place to stay. Great atmosphere, Good food available, great bar and service. Thoroughly enjoyed my stay! 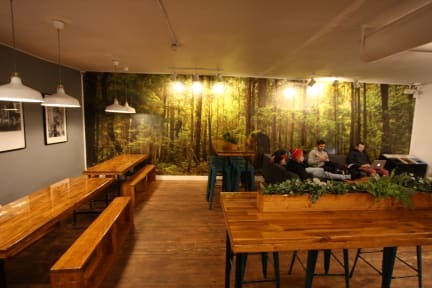 It was a great hostel in terms of location, rooms were simple and did the job; the showering and toilet facilities were great and always seemed v clean; the breakfast of coffee and bagels was unexpected and ver welcomed! Staff were super friendly and helpful with all queries. What topped it all off was the social scene: themed evenings of bar entertainment if you were at a loose end, and also hostel-run day trips at low cost/free. Great for solo travellers!